There are many species of Golden Drop found throughout the Mediterranean region, some with larger flowers than others. The one thing they all have in common is their bristly, hairy appearance. The hairs are so dense that they give the plants an overall greyish appearance. 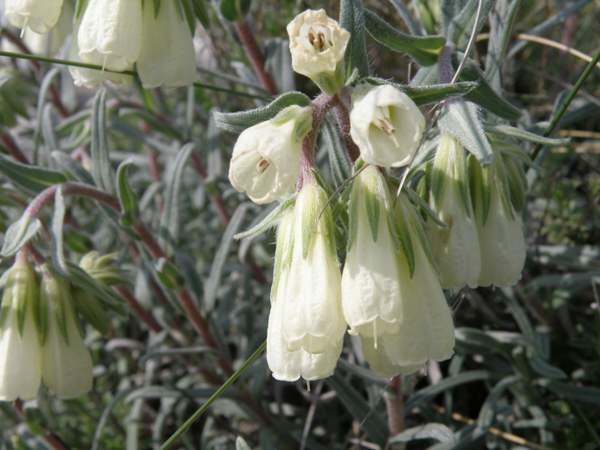 This one has very pretty creamy-white flowers that are slightly tinged with green. This lovely wildflower grows in rocky places on hillsides and high up in mountains. The flowers appear to cascade down the side of the plant in a most graceful and attractive way. The stems and leaves of the plant are covered with dense hairs giving them an overall greyish appearance. Pale Golden Drops flowers from the end of March through to the beginning of June. 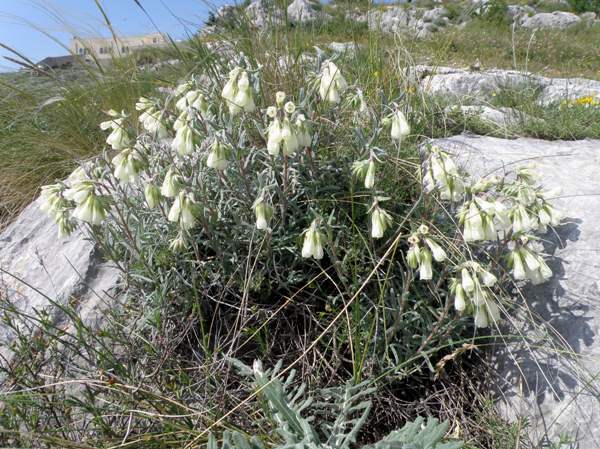 The plants shown on this page were photographed in the Gargano region of Italy in mid- April.